Cozy is the word to describe this vacation home away from home! This darling one king bedroom Pigeon Forge condo is full of warm and charming features: leather sofa and recliner, 30 inch flat screen TV/DVD player, and a wonderful seasonal gas fireplace. The open floor plan allows for great meals to come from the fully equipped kitchen while never missing a beat of the action or conversation in the living room. 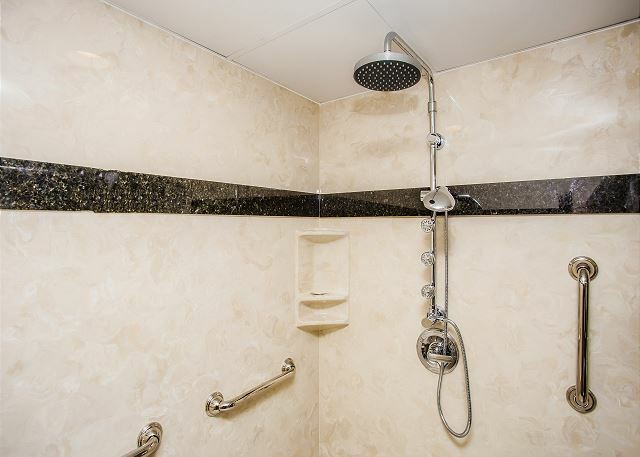 To complete this delightful unit is a newly added large walk in shower, a washer and dryer, and complimentary Wi-Fi. The spacious private balcony offers outdoor dining, additional seating and a fabulous Smoky Mountain view. What are you waiting for – Come see for yourself! This leaf season was the most beautiful Ive seen in a long time!! We are such fans of the Smoky Mountains National Park!! We always enjoy our stay at Whisperong Pines Condos! I reccommend this property to friends and family al all the time !!! Our mountains displayed their awesome beauty about 2 weeks later that usual but you were here at the perfect time!!! There is nothing quite like the beauty of the Great Smoky Mountains to absolutely take your breath away!!! If you experience stress in your day, flashback to the glorious beauty of the Mountains, take a deep breath, and feel the release of your stress. It is a great joy in life to live in this area. Blessings. I have stayed at Whispering Pines several times before. Like before it was a very pleasant experience. I love being able to sit out one the deck and look at the mountians. Thank you so much for being a loyal guest with us at Whispering Pines. We love hearing that you enjoyed your time with us by sitting on the balcony and looking at the mountains, what could be more perfect? We look forward to seeing you again soon. As always, everything was fantastic. Stay at Whispering Pines every year and have never had a problem, only a relaxing and enjoyable vacation. The location is great, close to all of the attractions and shopping but just set back enough from the parkway to be peaceful. The staff is outstanding. The only negative would be the sofa in the unit. It should be replaced. Thank you so much for your patronage to Whispering Pines! Your compliments of our property, our staff, and your experience truly means the world to us! We will definitely bring your comment regarding the sofa to the owner's attention. They appreciate the feedback when making updates to the condos. Otherwise, we're so happy to hear that you had such a relaxing and enjoyable vacation, just as you deserve! You get to make the most out of your vacation due to the convenient location of our property, to customize your trip to best fit your wants/needs. We welcome you back to stay with us again soon; we're looking forward to it! Thanks for the great review, hope to have you come back and stay again soon! We had a very pleasant stay , staff was friendly and very attentive, room was nice and clean,had a problem with the DVD player but they took care of it very quickly, everything was great! Thank you so much for staying with us at Whispering Pines! We are so overjoyed to hear that you got the necessary rest that you deserve. We do apologize for any inconvenience you experienced with the DVD player, but we do appreciate you bringing it to our attention to address promptly. We greatly appreciate you and hope to have you back soon! Everything was perfect! Everything was clean, the suites were well equipped, and the weather was warm and sunny. We would definitely recommend this location to a friend. Thank you so much for staying with us at Whispering Pines! We could not ask for a better review; PERFECT, just perfect. We greatly appreciate you and the beautiful weather you brought along with you. Your recommendation means so much and we hope to see you again soon! We got there a little earlier than expected and they let us go ahead and get our stuff up to our room. As always, very hospitable and curteous! Perks were very helpful too...free stuff! We are glad that you chose to honeymoon at Whispering Pines Condos in Pigeon Forge and that you will return each year to celebrate. We are happy to get our guests checked in as soon as the units are released to us by Housekeeping Inspectors. Thank you for the compliments to our Front Desk Staff; glad you enjoyed the Free Passes! Looking forward to your return visits. Congratulations and blessings for many years together. Excellent stay. Room was very clean and presentable. just all around good stay. We appreciate that you had an all around good stay; that is hard to beat. We appreciate your perfect Review, Title, and comments and look forward to your return. Thank you so much for staying with us at Whispering Pines! Thank you for your kind words about our property and we hope you really enjoyed your visit with us. We definitely welcome you back and hope to see you again soon! Whispering Pines is our go to resort whenever staying in the Pigeon Forge area. This is our 3rd time staying at the resort and won't be our last. We were able to save $30+ by purchasing our Dollywood tickets at the resort instead of the gate. I highly recommend this place and will be back again. Thank you so much for staying with us at Whispering Pines! A title like that, your "go to place to stay" is something we work very hard to obtain and fully intend on keeping! We know when it comes to all the attractions the Pigeon Forge has to offer, every penny counts! So we are glad to hear of all the savings you able to receive by vacationing with us. We truly appreciate you, your business, and your recommendation of us. We will see you for that fourth stay and hopefully many, many more times in the future! Thank you so much for staying with us at Whispering Pines! We truly appreciate you, your loyalty, and kind words about us. It is music to our ears to hear a title like that, your go to place to stay in Pigeon Forge! That is our goal, to be your home away from home. It is so heartwarming to hear that we accomplished that, and that you have made wonderful memories to last a lifetime. Thank you for that! We couldn't ask for better review, and can't wait for your next visit with us! Thank you so much for vacationing with us! We hope to have you stay again in the future. great! everything we needed. clean great view. will be back. Thank you so much for spending your honeymoon with us at Whispering Pines! Now, we hope to become your anniversary spot for many years to come! Congratulations, and we welcome you back to see us again very soon! We stayed here for a Friday and Saturday night. It was WONDERFUL. The view was spectacular. Loved being in the tree tops with the mountains in the background. Only complaint is the sleeper sofa was not at all adequate. Our son was sleeping on the frame bar because the mattress was too thin. Would recommend a better mattress for the bed. Thank you so much for staying with us at Whispering Pines! We love the mountain views that you get to see in condo 451 and we're so glad that you did too. We're very happy to hear that you had a wonderful time. We will definitely pass along the comments about the sleeper sofa to the owners and we're very sorry for any inconvenience that this may have caused. We hope you'll come and stay with us again very soon! As always we enjoyed our stay at whispering pines. Great accomedations. Looking forward to staying again in the fall! Thank you so much for staying with us again at Whispering Pines! We appreciate your business and loyalty very much! We're happy to accommodate always! That is exactly what vacation is all about, relaxing days! So we will see you in the fall, for your next dose of well deserved relaxation. Thank you so much for staying with us at Whispering Pines! So happy to hear that you thoroughly enjoyed your stay with us enough to recommend us to your friends and family! Can't wait to continually live up to that recommendation of yours; to give everyone a great experience staying with us. Again, thank you and we definitely look forward to your next visit! The rental was nice and efficient for our family of four. The front desk staff was friendly and helpful. The night we went to the pool was a bit crowded though. However, the overall experience was good. Thank you so much for staying with us! We are glad you all enjoyed your stay and it was certainly really busy this spring break! We hope to see you with us again soon! We checked in after hours and had to use the code box to get our key. The code and instructions we were given worked perfectly. The bedroom was small but the mattress was very comfortable. My biggest complaint with the bedroom is that light came in around the blinds and diatribed us. Curtains would gave been nice. The shower and bathroom were clean and worked very well. The kitchen was equipped with all the dishes we needed. The biggest downside of this room is I couldn't get the dryer to dry the clothes very well. I empty the filter and it didn't seem to help. That was the most frustrating part. Overall it was a very nice stay and a room we will consider again. Thank you so much for staying with us and we are very sorry for the issues you experienced! Anytime you have any issues at all during your stay please let us know immediately and we will do our very best to get things taken care of for you as soon as possible! We are happy you enjoyed your time with us otherwise and we hope you will come back and stay with us again soon! The only negative for the trip was not knowing how long it would take to visit Cade's Cove. Next time we will plan the whole day so we have time to enjoy everything there. We went from bright sunny days to rain and snow flurries in 3 days, but we enjoyed our trip. The condo was in a good location, clean and quiet. Having the free tickets was definitely a plus. We will go back again. Thank you for staying with us at Whispering Pines. We are delighted that you enjoyed your stay even with the unpredictable weather. 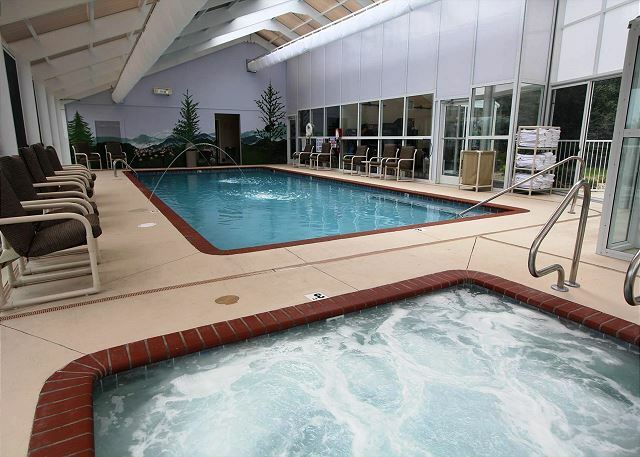 We are glad that you were able to take advantage of our Free amenities package. We look forward to seeing you again soon. Whispering pines was a great place to stay very clean and nice inside would definitely stay there again! We appreciate your visit, perfect review and awesome comments. We are glad that you had a great time and that you will visit us again. The condo we were in on the 5th floor was clean, provided everything we needed plus a great view of the mountains. The weather, however, was COLD for us Floridians. The unusual part was so was Jacksonville, Fla (our home). Might try a spring or summer trip. We appreciate your vacationing with us at Whispering Pines Condos in Pigeon Forge. We, too, are suffering with our unusually cold weather; don't remember it being so cold last year. A late Spring or Summer vacation with us would probably be ideal for you since we will have warmer temperatures. Looking forward to seeing you then. A very relaxing time. Easy checkin. Really easy to access all of the area attractions. This was our second stay will be staying here again on our next visit. We are glad that you had a relaxing getaway at Whispering Pines Condos in Pigeon Forge. We appreciate your wonderful comments and perfect review; looking forward to your return visits. Well, we extend to you a very big THANK YOU. It is our pleasure to meet wonderful people as you. We are glad that you had a great experience and that you will visit us again. We were very please with our condo. We were able to see the fall leaves change colors from our deck. 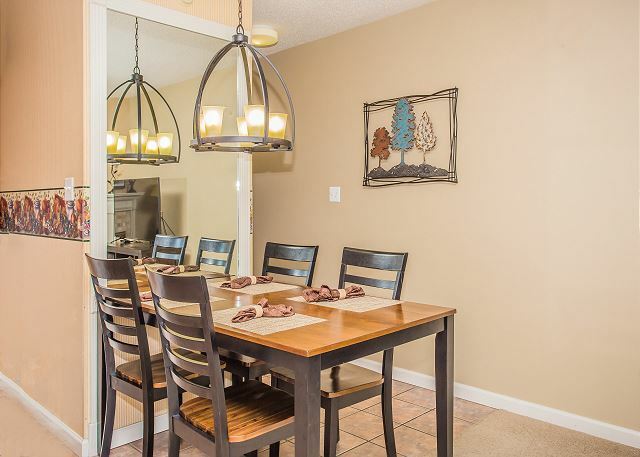 Whispering Pines has a great location overlooking Pigeon Forge and near the Smokies and shopping areas. Love this place! We love this place, too! It is such a wonderful, beautiful area to live and work. Wonderful people like you make it even better. Watching the leaves/mountains change colors is breathtaking; makes you want to stay on balcony but there are shops, activities, and restaurants to visit. We appreciate you and look forward to your return visits. Great! Thank you for staying with us! Come back and see us again anytime! Overall it was great! The washer & dryer in the unit could use an update. It doesn't dry well at all. Thank you for staying with us at Whispering Pines. We are pleased that you enjoyed your stay. We will contact the condo owner in regards to your update suggestions. We appreciate your review and look forward to your next visit. Obvious it is a little old but seems well maintained. A half bath would be nice but otherwise had all we needed. Really enjoyed the lazy river. Great! Glad you all enjoyed your time with us! Hope to see you all again soon! As always a beautiful, clean, and comfortable place to stay. The staff is always nice and they are always there to help with anything we need. Thank you for taking a spur of the moment vacation with us. We appreciate your perfect review and comments and look forward to your return visits. The room was very clean and the views were amazing. We loved the pools and lazy river. The staff was great at check in and the free tickets were actually free. We didn't have to sit through any sort of sales pitch. The dryer in our unit did not dry, even after cleaning the lint trap, the sofa bed mattress was VERY thin, and the dishwasher was extremely loud. Even with those few things, the room was a good stay overall. Thank you for staying with us! We truly appreciate you and we are happy you enjoyed your stay with us! We will bring your concerns to the attention of the owner. We hope you will come back and see us again soon! We had a great say at this property. The only thing that could have been better, would be the Bed. The mattress was slightly worn, My wife and I found yourself rolling to the center of the bed. Other then that it was a very clean living space, strong Wi-Fi. Thank you so much for staying with us and for the feedback! We will make sure the owner is made aware of the bed. We are happy you enjoyed your time with us and we look forward to see you again! Thank you for your wonderful feedback. We appreciate your patronage and look forward to seeing you again soon. My wife and I were looking for some rest with a view. We got it. Very quiet and cozy spot. Clean and comfortable. Thank you for staying with us at Whispering Pines Resort. We are glad that you were able to rest and relax while enjoying a great view . We appreciate you and your wonderful review. We welcome you to stay with us again when visiting our beautiful area. Our stay was fine. 1st condo for us. We enjoyed being able to cook and relax without having to fight the traffic. It was clean everything worked. Needed more hot water available for that size jacuzzi tub. Thank you for choosing Whispering Pines Resort for your first condo experience. We are glad that you enjoyed the convenience and had a relaxing time without the fuss of the holiday traffic. We appreciate you and hope to see you again in the near future. Great location, room was nice and clean! Thank you so much! We appreciate you staying with us and we look forward to seeing you again soon! One of the most relaxing and enjoyable visits ever. We have stayed at Whispering Pines Condos several times before & always look forward to the next visit. Peaceful, quiet, and refreshing!!! Awesome sauce! Glad you had a great time and thank you for all the kind words! Come back soon! We enjoyed the convenient location and free DVD rentals. We weren't in town long enough to take advantage of the free show tickets or pools but, plan to return and use those amenities/benefits. Our unit was comfortable and had a good view. The carpet had several noticeable stains that need to be addressed and the entertainment stand had a door that when open is in the direct pathway of the living room entrance. Hanging the TV on the wall would correct this issue and dramatically increase the living room space. Thank you for choosing Whispering Pines Resort for your recent stay in Pigeon Forge. We are sorry that you were not able to use all the FREE amenities that we offered during your stay. Thank you for letting us know about the carpet issue, we have it scheduled to be cleaned right away.We will contact the condo owner in regards to your suggestion about hanging the television on the wall. Thank you for your feedback and we hope to see you again soon. Thank you for staying with us at Whispering Pines. Come back and see us again! we really enjoyed the property that we stayed in. waking up and getting to go outside and see that view was wonderful. the condo was very clean. needed a little update. needed new mattress and couch. the workers around the property was very polite and so was the desk. Glad you were able to enjoy that mountain view each day! I will pass along your comments about the couch and mattress to that owner so they can look into a replacement. Thank you for staying! Hope to see you again soon. Enjoyed both the outside and indoor pool. 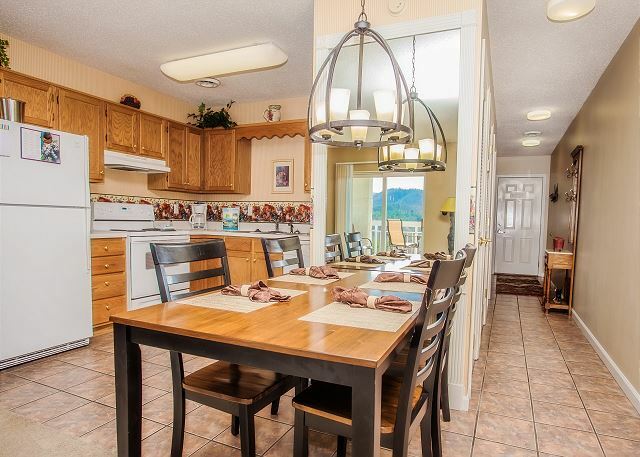 Good location close to everything in Pigeon Forge. Thank you so much and we are so glad you enjoyed your stay with us! WP 451 has a gorgeous view of the mountains! We are glad too see you enjoyed all of our pools and Lazy River as well! We hope to see you agin on your next Pigeon Forge Vacation! No complaints. Close to everything, but with a mountain view felt like being away from it all. Would return on another visit. Thank you for staying with us at Whispering Pines. We are glad that you had a great experience while staying with. We look forward to your next visit. 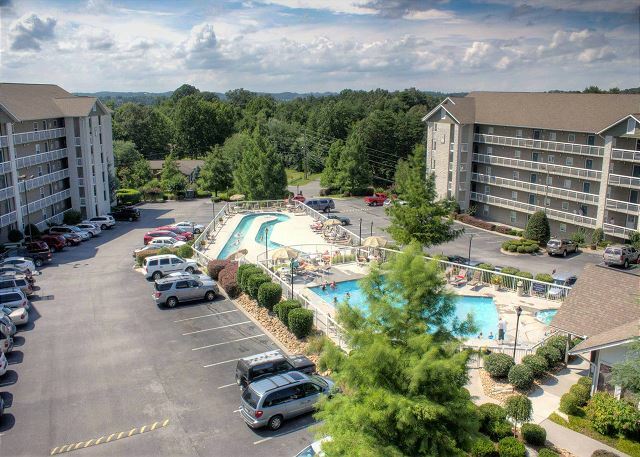 We appreciate your wonderful review of unit 451 at Whispering Pines Condos in Pigeon Forge, TN. We are looking forward to your return as you are. See you soon. everything it said it was, clean, convienent to everything, staff were very friendly and helpful. Whispering Pines is always our first choice. great ammedities. Love Love Love this place. Its a 5 star for this family!!! We are appreciative of your excellent review which describes Whispering Pines Condos very well! We enjoy our work and look forward to your return visits to Pigeon Forge, TN. Always enjoy our visits. One of our favorite "perks"are the free movie rentals. We were disappointed with that this time, not as much different to choose from, and what was was rated R, and we don't normally enjoy movies with lots of language. Getting more "clean"family type not animated- would be a good addition. However, all in all our stay was great, always clean, & that makes me feel comfortable. Its almost always quiet, & we feel safe. Thanks! We are so happy to hear that you enjoy your stay with us at Whispering Pines. We will make a recommendation to our movie supplier to put in more family friendly movies for guests to pick from. Thank you for your business and we hope you have a wonderful 2016. Our 2nd visit to Whispering Pines and once again very enjoyable. Everything was clean, but the carpet needed a good stain removal & the blinds would not open on the sliding door. as shown in picture. 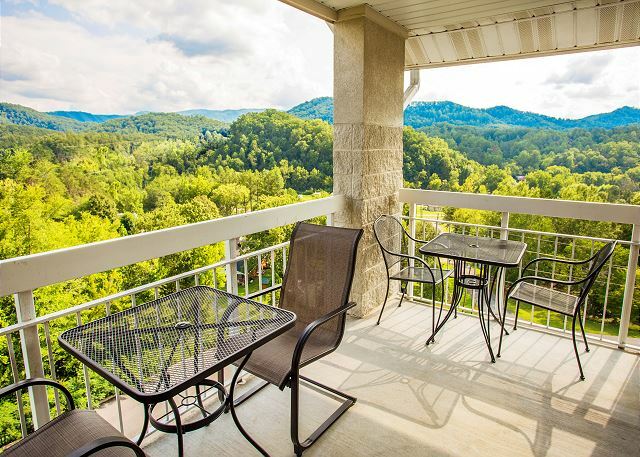 Yes, unit 451 at Whispering Pines Condos in Pigeon Forge, TN, does provide a great view of the mountains. We are glad that your return visit was enjoyable, also. We will schedule a cleaning for the carpet. When trying to open the blinds, make sure to twist the wand and turn the blades perpendicular to the glass door before sliding the blinds to open position. Come again. Very clean and Comfortable. Was very nice. We were worried that when we booked our vacation that we would not get the room that was in the picture. We have booked online before and got the shock of life!!!! It was great that when we got to our room that it was what was in the pictures. the whole resort was very nice. The staff was very nice and pleasant. We will stay again in the future and would recommend it to everyone. Thank you so much! Glad to enjoyed your stay and everything was as you had hoped. We always appreciate our guests! Hope you are well now and you can start making plans to return to Whispering Pines Condos in Pigeon Forge, TN. Thanks for your review. We had a great vacation and our condo did not disappoint. Thank you for your review and for staying with us in unit 451 at Whispering Pines Condos in Pigeon Forge, TN. We are very glad that you were not disappointed. Come again. It was our first stay with Resort Properties. We loved the idea of having the extra space and like "home" living. The view from the balcony was breath taking. We had everything we needed and then more. I found the staff very friendly and helpful. I will be staying here again soon! Thank you for choosing Whispering Pines Resort for your recent stay in the Pigeon Forge/Great Smoky Mountain area. We love to hear that you enjoyed your stay , the views that we have to offer and that the condo had all that you needed. Thank you for the kind comments regarding our staff as well. We look forward to seeing your during your next visit with us. This was a wonderful property that was just the way it was described. It was properly cleaned and very well maintained. The front dest was awesome. I will stay again in the future. Thank you for staying with us at Whispering Pines. We are so pleased that you found the resort to clean and well maintained. Thank you so much for your kind comments regarding the front desk staff. We look forward to your next visit with us. Thank you for staying with us, we look forward to seeing you soon! G-pa and G-ma stayed in room 454,with daughter and her two kids. Son and his wife stayed in 451. We all had a great time. Grandson 9 years old at the time said grandpa greatest place ever. We love to hear that you brought your family to stay with us. We hope that you made many wonderful family memories during your stay. Thank you for your review and we hope to see you again soon. It was nice . I just wish they would give 2 attraction tickets instead of one!! Glad to hear you enjoyed your stay with us! When staying with us we do give you 4 daily free attraction tickets to Country Tonite, Ripley's Aquarium, The Wheel at The Island and the Lumberjack Feud Dinner Show. We also offer unlimited DVD Rentals. This is given to you as a thank you for choosing to stay with us in Pigeon Forge. We also sell discounted tickets here at the front office. We try to help as much as we can. We hope you enjoyed the attractions in Pigeon Forge and made some wonderful memories! We hope to see you again soon! Thank you for staying with us at Whispering Pines. We are glad to hear that you had a nice stay. We are happy to provide FREE amenities to our guests however we cannot provide a Free ticket for each person in the party. We hope you can visit with us again soon. It was fine. Nice room, quiet area, close to the things that we wanted to do. Thank you for choosing Whispering Pines Resort for your recent stay in Pigeon Forge. We appreciate your patronage and hope that you can visit us again soon. Wonderful as all previous times here. Very nice amenities and the staff is so nice. Thanks for continuing to stay with us! We appreciate you and look forward to your next visit! Thank you for your recent visit to Whispering Pines . We are glad to hear you had a very pleasent stay. We look forward to seeing you again. Thank you for your recent visit to Whispering Pines . We are glad to hear you had a very nice stay. We look forward to seeing you again. Very satisfied with my stay at Whispering Pines, Condo 451, and will stay again. Condo 451 has a great view of the mountains and the reason I chose 451. Thank you for your feedback. We are happy to hear you enjoyed your stay at Whispering Pines condo 451! We appreciate any recommendations and look forward to your next visit! We have stayed at Whispering Pines several times over the last several years. We have stayed other places, but we keep coming back to Whispering Pines. This rental was nice and clean, but not as updated as some of the others we've stayed in. The mattress wasn't the best, but overall, it was a great room and clean. Thank you for being a loyal guest at Whispering Pines. We really appreciate you and your kind comments regarding your stay. We will pass along to the condo owner your information regarding the mattress. Thank you again for staying with us and we hope to see you again soon. I have been staying at Whispering Pines for at least the last 4 years twice a year. We really like the location and amenities. The only complaint I have is for the recent visit. he king size bed slept OK but every move made had a terrible creak. Other than that everything was good. Thank you so much for being a loyal guest at Whispering Pines Resort. We really appreciate you. We are sorry to hear that you had an issue with the bed during your recent visit. Please always let the front desk know when an issue arises so we can resolve it promptly. We will forward this review to the condo owner and also have the bed checked by our maintenance department. Our condos are individually owner and the furniture/decor will be different in each condo. Please let us assist you during your next reservation to find a condo that best fits your particular needs. We look forward to seeing you during your next stay with us. The shuttle bus was great going back and forth I was disappointed the fire place was not on ( 40's during the night) and we did have several ants in the bathroom, other than that the stay was great as usual !!! We were so happy we were able to get the shuttle set up for our guests-props to Rocky Top Tours for helping us out! We do have set times of the year we turn the fireplaces on, for multiple reasons, but please do always ask us because if it is close to that time sometimes we can go ahead and get them turned on for you. We certainly want you to be able to enjoy as much as possible during your stay. Thank you for staying with us and we hope you return soon! Excellent Place to spend your vacation!!! We love staying at Whispering Pines, it is the best of both worlds. We can sit on our balcony and enjoy the mountains and still be only a block from the parkway. You cannot see the parkway from our condo. It is like being out in the mountains yet you are close to all the entertainment and shopping. We appreciate you so much Diane! Love hearing you had a great stay-we agree that condo 451 has an excellent view! Please come see us again in the future! This was the second time I have stayed at Whispering Pines and both times were great. Convenient location, quiet, and property was wonderful. I would stay again if I were in the area and definitely would recommend it to family and friends. Thank you for visiting with us and for the kind words. We certainly look forward to seeing you and your family/friends in the future. Very professional staff. Great location to restaurants and shopping. Nice amenities. Stayed in a one bedroom, nice but not very spacious in bedroom. Needed more room to place things. Wish bathroom vanity was larger. Overall Whispering Pines was a very nice place to stay. Thank you for staying with us at Whispering Pines. 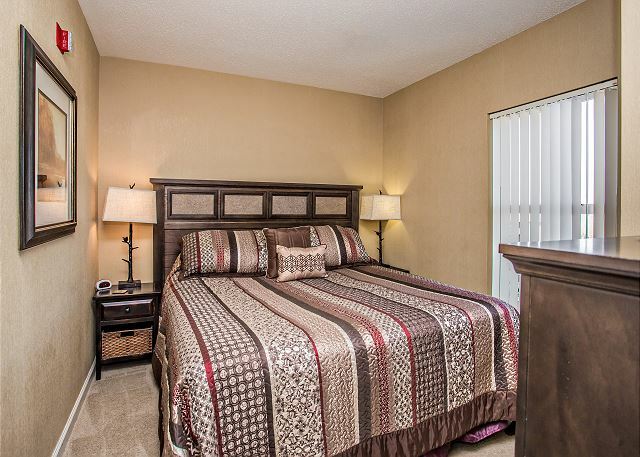 Please try one of our two bedroom condos during your next stay to see if it would be more suitable for your needs. We hope to see you again soon! Whispering Pines is an awesome place to stay in Pigeon Forge! 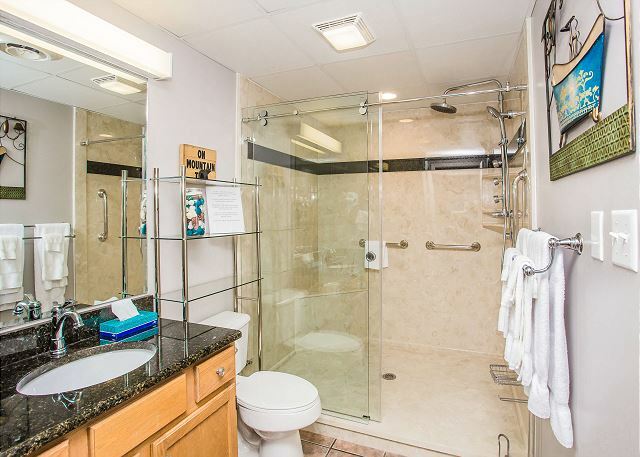 When I booked our condo online and saw the pictures I hoped that it would look like that when we got there. It absolutely did!! Exactly as the picture online showed. The condo was spotless and the place was very quiet. We had an end condo which had a very nice view from the deck. Also being stocked with everything was so great - only bringing personal items(and food if you want it)is great! There is so much to do and see but one of my most favorite shows was the Dixie Stampede. Bought tickets at a reduced price from Whispering Pines office and the show was well worth this and more. Also if you want to go to Gatlinburg it is only about 10-15 minutes away from Whispering Pines. Thank you so much for your wonderful review. We could not be happier to hear that you enjoyed your stay and that you found your condo to be exactly what you saw online. We also wanted to thank you so much for your comment regarding the cleanliness of your condo; this is one of our highest priorities at Whispering Pines. We hope to see you again soon when your back in the Pigeon Forge area. Loved our condo. Would stay there again. Thanks for vacationing with us, come see us again! We stay at Whispering Pines every time we are in Pigeon Forge which is at least once or twice a year. We will continue to stay here as long as they don't change. Thanks for helping make our vacation special every time we stay with y'all. May God bless y'all. Thank you for staying with us and God Bless you too! HAD A GOOD TIME--- THE UNIT I STAYED IN WAS CLEAN BUT, THE BED WAS A UNCOMFORTABLE. Thank you for taking the time to fill out a review as it really helps us and the owner of the condo ensure we do everything we can to guarantee our guests have an enjoyable stay. I have passed the bed information on to the owner of that condo and they will be looking into the issue. We hope you and your family will stay with us again in the future!